Around the world, around the clock, transport authorities, operators and communities are benefiting from smart digital technologies developed and supplied by Flowbird Transport Intelligence. The company’s latest innovations, showcased at Transport Ticketing Global in London, include two cloud-based systems – a new modular Account Based Ticketing system and Cloudfare®, a scalable multimodal network management platform. Flowbird works with transit authorities and public transport operators across Europe, Africa, Australia and the USA, with an installed base of more than 95,000 transport validation terminals and over 7,000 self-service retailing terminals covering bus, BRT, rail, metro, ferry and tram networks – all optimised through sophisticated back office and analytics platforms. 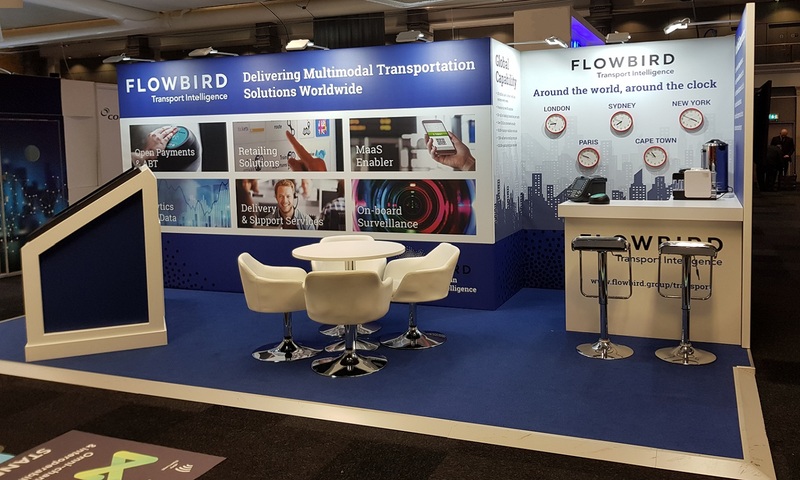 “Through our facilities in the UK, France, USA and Australia, we are harnessing the power of digital innovation to meet the transportation challenges of an increasingly urbanised world,” says Gavin Trimnell, Head of Sales and Marketing at Flowbird Transport Intelligence. Account Based Ticketing Technology – Launch of a new Account Based Ticketing system, set to go live with transport operators in Europe and USA, enabling account holders simply to ‘tap and go’ with a registered bank card or mobile device. The ABT platform tracks journey ‘taps’ and aggregates every step across all modes of transport via multiple operators to apply the cheapest fare configuration rules. Operators benefit from ABT architecture through cost and efficiency improvements by shifting core ticketing and related functions to a secure cloud environment, reducing reliance on local ticket issue, cash handling and associated infrastructure. Cloud-based Technology – Deployment of Cloudfare®, a modular, scalable and flexible platform delivering remote management and control of multimodal network assets and systems, including ticket retailing infrastructures of any size. Its multi-layered approach enables operators to take a system-wide view of performance in real time – and to quickly identify and resolve issues at a device level. At the same time, its intuitive, visual analytics can drive operational improvements while creating scenario-based future modelling for longer-term planning. UK Rail – Launch of Flowbird’s transformational Rail Ticket Management System (RTMS), a completely new retailing system designed to bring TVMs into the 21st century. Since the announcement by the Secretary of State directing rail operators to offer paperless travel on UK railways, Flowbird has been working with Train Operating Companies and industry partners to develop RTMS to support the Smart Ticketing for National Rail (STNR) promise. In 2019, Flowbird will implement RTMS across a large estate of TVM devices in the UK as the core retailing software for the UK market. Ouargla, Algeria – A complete ticketing system incorporating tram and park and ride schemes in Ouargla, one of the most important cities in the country, positioned at the gateway to the Sahara. Flowbird was chosen to create the first of a number of country-wide networks in a scheme that includes 235 validators and entry and exit technology at Relais Parking. The technology was adapted to be resistant to sand and high temperatures. Canberra, Australia – Flowbird has installed new touchscreen ticket vending machines at major bus stations in Canberra, with TVMs also planned for the Belconnen bus station and all light rail stops. For the first time, passengers can now top up their MyWay cards instantly for bus and light rail, check their MyWay balance or purchase a single or daily adult or concession ticket via the machines, which also provide four language options: English, Arabic, Chinese and Italian. Perth, Australia – The Public Transport Authority of Western Australia has appointed Flowbird as prime contractor for its SmartRider network, one of the world’s most successful multimodal transit schemes. The new contract covers the provision of on-going services to the PTA and the expansion of technologies that underpin a transport network covering bus, rail and ferry operations. Northern Ireland, UK – Deployment of one of the world’s most advanced public transport ticketing systems for Translink. Customers using the new Glider bus rapid transit in Belfast will be the first to benefit from Translink’s Future Ticketing System (TFTS), which will roll-out across all Translink bus and rail services in Northern Ireland over the next few years to create the UK’s largest integrated multimodal system outside London. Indianapolis, USA – The Indianapolis Public Transportation Corporation (IndyGo) has contracted with Flowbird to develop an Account Based Ticketing solution that will allow passengers to move across the IndyGo network, including the local fixed route transit service, bus rapid transit service and paratransit service. In addition to self-service retail systems and a mobile app, Flowbird will provide cloud-based reporting and system management where all products, fares, and messages can be remotely changed in real time. Ireland – Flowbird has supplied 200 new driver ticketing consoles to Bus Eireann, and have updated the existing Dublin Bus system to ensure many more years of reliable operation. South Africa – Flowbird has completed the roll out of a 1,300 bus system for Golden Arrow Bus Services (GABS), introducing a new smart card system for Cape Town’s residents, which has proved hugely popular, while also receiving a first order for its Wayfarer 6 driver console from one of the country’s new independent operators. Gibraltar – Flowbird has installed a 25-bus Automatic Fare Collection system including smart cards for regular travellers and tourists. Rebrand and Website – Parkeon and Cale, world leaders in parking and transport ticketing solutions, joined forces last year to create a new global entity under the brand Flowbird. This led to the rebranding of Parkeon Transportation to Flowbird Transport Intelligence. A new global website for the business was launched in 2018, highlighting the company’s worldwide reach and technological expertise in world class multimodal transportation solutions.